—the hustle and bustle of the holidays is upon most of us and downtown Wilmington is dressed for the occasion. Everyone is welcomed to visit the downtown to save on shopping, see Santa and take a stroll on Market Street with beautiful window scenes. As in years past, the lamp posts will take on an old-fashioned feel with garland and bows and the streets will don twinkling lights—making it a festive atmosphere for those looking to do some shopping. 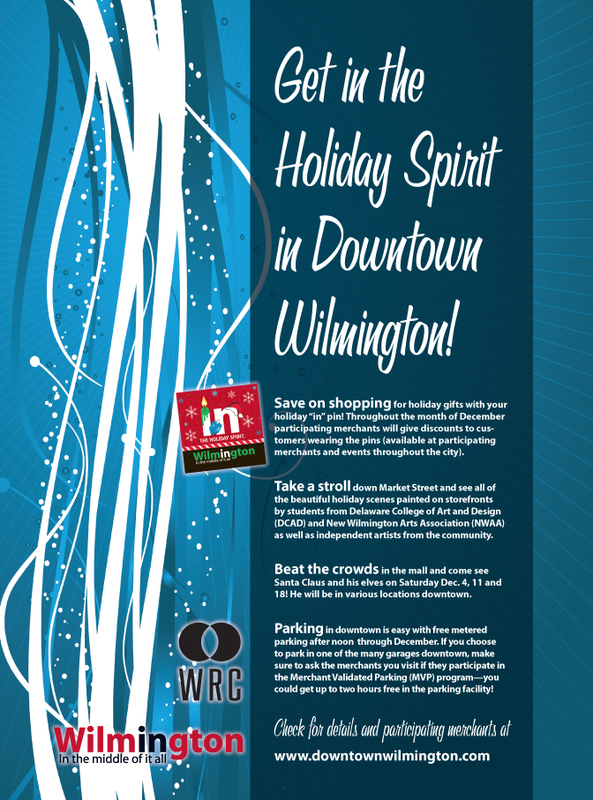 The Wilmington in the Middle of it All campaign continues to go strong and those with holiday “in” pins (available at many downtown merchants as well as in the mayor’s office) can reap the benefits. Participating downtown merchants will offer discounts to those with the holiday pin throughout the month of December. The variety of stores downtown offer stocking stuffer items, ties, shirts and suits for men, jewelry, watches, sneakers, casual wear, restaurant gift certificates, fur coats and much more. The merchants offering the discounts can easily be identified by the signage of the holiday “in” pin on their front doors. In addition to the shopping discounts, and added to the festive look of Market Street, will be the Arts in Windows along the main corridor. Students from the Delaware College of Art and Design (DCAD), New Wilmington Arts Association (NWAA) and independent artists decorated storefronts with holiday scenes that range from traditional to not-so-typical. The holiday season wouldn’t be complete without Santa Claus and downtown will host the jolly old elf each Saturday in December—Dec. 4, 11 and 18. The location will vary from week to week (details at www.downtownwilmington.com). Families can beat the crowds at the malls and take their time telling Santa their wish list in downtown Wilmington. During the holiday season, parking downtown has never been easier. Throughout the month of December, the meters are free starting at noon each day. Also, many of the merchants participate in a program called the Merchant Validated Program (MVP) which allows them to give customers vouchers for up to two hours free in participating parking garages. Downtown Wilmington is always full of excitement, but the holiday season is a perfect time to take time to enjoy all it has to offer. for all the details and participating merchants.